With the Schlage Touch Keyless Touchscreen Accent Lever with Camelot Trim in Aged Bronze, there's no key to lose, no re-keying or cutting new keys no keys at all, thanks to our cylinder-free design. You can finally go for a run or take the dog for a walk without juggling keys or stuffing them in your sock. All in a slim profile and stylish trim that pairs perfectly with interior hardware. The Accent lever is widely popular for its elegant wave-like design that effortlessly matches a room's style without overshadowing it, while the Camelot trim's scalloped architectural details make any room charming and approachable. Our Aged Bronze finish is inspired by traditional design, featuring warm, copper tones that break through its darker, aged exterior. Plus, it's been designed and tested with strength and durability in mind. 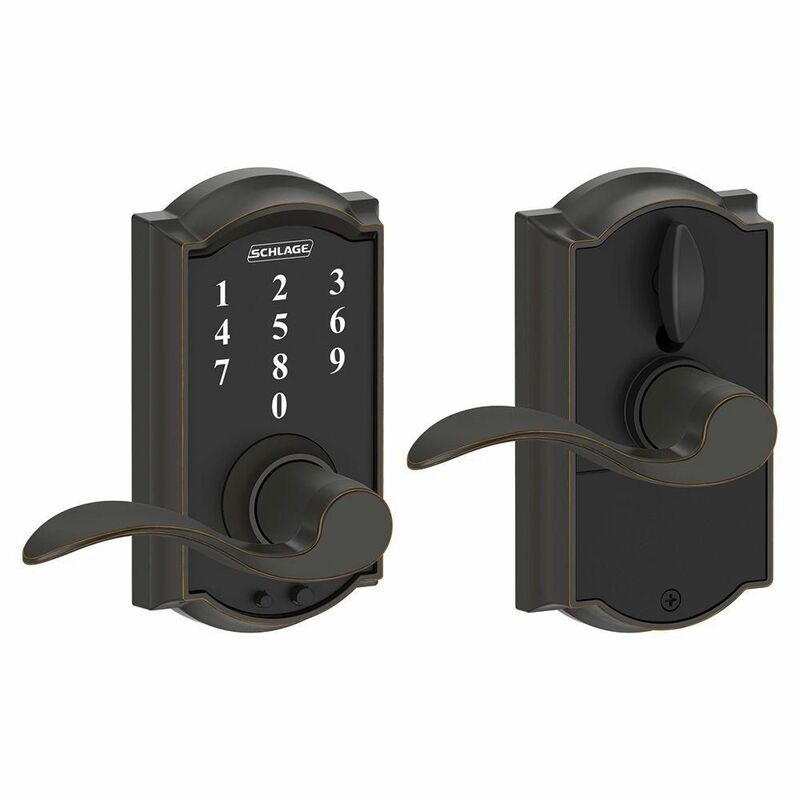 Affordably outfit exterior doors with this lockable lever set from Defiant. The Naples keyed entry lever easily mounts to doors 1 3/8-inch to 1 3/4-inch thick with the included hardware. Perfect for all entry doors security is desired. Provided with this set is an adjustable backset and interchangeable faceplates for drive-in and traditional installations. This sturdy lever nicely coordinates with other fixtures in your home for a cohesive look. A lifetime warranty ensures that this device will withstand frequent use. The Schlage Century Lower Half Handleset and Latitude Lever in Satin Nickel is perfect for use with an electronic deadbolt for a complete front entry set. The Latitude lever offers a crisp perspective on minimalist design with its clean lines and rectangular features especially when wrapped in our versatile Satin Nickel finish. Plus, it's been designed and tested with strength and durability in mind. The Schlage Avanti Lever Keyed Entry Lock in Antique Pewter unlocks when the door is opened from the inside, allowing you to leave quickly and conveniently, and re-enter easily. The Avanti Lever's sharp curve adds drama to any space, and our rich Antique Pewter finish adds an extra touch of sophistication. Plus, it's been designed and tested with strength and durability in mind. Touchscreen Lock Camelot/Accent Lever Aged Bronze With the Schlage Touch Keyless Touchscreen Accent Lever with Camelot Trim in Aged Bronze, there's no key to lose, no re-keying or cutting new keys no keys at all, thanks to our cylinder-free design. You can finally go for a run or take the dog for a walk without juggling keys or stuffing them in your sock. All in a slim profile and stylish trim that pairs perfectly with interior hardware. The Accent lever is widely popular for its elegant wave-like design that effortlessly matches a room's style without overshadowing it, while the Camelot trim's scalloped architectural details make any room charming and approachable. Our Aged Bronze finish is inspired by traditional design, featuring warm, copper tones that break through its darker, aged exterior. Plus, it's been designed and tested with strength and durability in mind.